Owen + Mzee = true! This is just too cute not to write about! 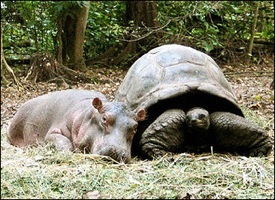 A year after they first met, Owen, the baby hippo that survived last December’s Tsunami, and Mzee, a 130-year-old tortoise are still best pals. They live together at the Haller Park preserve in Mombasa, Kenya. Read more in Tale of the tortoise and the hippo. When I saw this post in my RSS reader not one link from a snopes.com (myth buster-ish) post, I was afraid it was going to prove false. I was happy to find that this touching story is true! i have been following this inspiring story of friendship with awe. i am now concerned to read that there is a plan to introduce owen to another hippo. i think it is wrong to separate these two animals until there is an indication from them that it is necessary. because this is such an isolated situation, there is no good example to call upon for what is appropriate and best for each of the animals. my instinct is that it would be best to wait until owen is atleast 4 years old as he seems to have transfered his need for his mother to mzee and even then it would be best to follow the lead of the animals themselves. I guess it's a hard call… While it might be good for Owen to meet and maybe live with another hippo, I don't think it should be at the cost of excluding Mzee from his life. The first time I heard about this story is Jan 8 2005, when I was on the flight from Hong Kong to US. I read it from the newspaper, I cut this part and still keep it. I am a turtles/tortorises lover, I love to hear everything about this animal. This is a real touching story and make me smile everytime when I hear the update. Yes, I think we need nice stores like this to balance all the evil that's going on in the world. I'm the photographer who took the shots, and still very closely involved with Owen & Mzee. Alot of people are worried about introducing Owen to Cleo and don't like the idea of breaking upt the relationship with Mzee. As wonderful as it would be to keep them together, there are a couple of big problems. Firstly, like all young animals, Owen is learning alot from his guardian. In particular, he is copying Mzee's eating habbits. He seems to be doing pretty well, but nobody is sure what the long term effects might be of a hippo eating leaves like a tortoise, rather than the grass that makes up a hippo's normal diet. Secondly, as sweet as Owen is now, he won't stay that way. He'll eventually get to over three tonnes. These photos don't show it, but Mzee already bears the scars of another encounter with a fully grown hippo. A few years ago, another hippo friend rolled Mzee like a football and cracked his shell rather badly. There's no suggestion that Owen will do the same, but he could still inadvertently do a lot of damage. Although the risk is still relatively slight, the consequences of a wrong call would be disastrous. And like all difficult decisions, the longer they wait, the harder it will become. Of course if Owen and Cleo don't get along, or Owen seems too attached to Mzee, they'll rethink. But for the sake of all three (remember — Cleo has been alone for years too) it makes sense. I heard there was a documentary screened at this year's Tribeca film festival and wondered if anyone had seen it yet? I'd love to see the both of them in action. it has been several years since i have heard the results of separating owen ans mzee and introducing owen to another hippo. what happened? how is owen adjusting? i am anxious to know.